Welcome to Dru's Cozy Report: February 2013. This month we have one new series and two returning series for your reading pleasure. In the pub, she’s swamped with drink orders as everyone in town gathers to talk about the recent discovery of a nearly one-hundred-year-old body in a nearby bog. When Maura realizes she may know something about the dead man—and that the body’s connected to another, more recent, death—she fears she’s about to become mired in a homicide investigation. After she discovers the death is connected to another from almost a century earlier, Maura has a sinking feeling she may really be getting in over her head. I was hesitant to read this book only because I like my stories to take place in America, but I have to tell you that I’m so happy I did because this is a fantastic story. 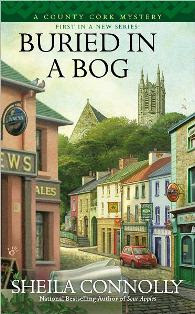 A long buried body suddenly appears as Maura arrives in Ireland. When she discovers a possible clue to his identity, she is later threatened, but that doesn’t deter her from helping the gardai put a name to the body and catching a killer. The mystery was good as I had to know what happens from chapter to chapter and enjoyed the surprising twists that concluded this wonderfully crafted story. Maura is a great heroine and I was rooting for as she embraces her new surroundings. What I liked best about this story is that Maura didn’t actively pursue being an amateur sleuth, rather the clues came to her in the many conversations she was having with the people in her newly adopted town. The author did a great job of pulling me into this story that boasts a great secondary cast that surrounds Maura, from the village itself, to Mrs. Nolan, from Mick to Rose to everyone she meets along the way. I’m so excited for this series and I can’t wait to read what awaits our Maura in her next adventures. This is a great beginning to what I hope will be a long-running series. FTC Full Disclosure - The publisher sent me a copy of this book. When naturopathic doctor and shop owner Willow McQuade’s ex-boyfriend Simon Lewis invites her to a party for the cast and crew of a new television show at Long Island’s scenic Bixby Estate, she’s most excited to visit the property’s exclusive lavender farm. But a whole field of her favorite stress-reducing herb can’t provide enough soothing support to calm the effects of a murder! When her ex asks for her help in clearing his name, Willow and Spade find themselves in a mansion where murder is afoot. When she is warned away from helping, this spurs her on to find the identity of the culprit who would stop at nothing to keep what is theirs. This is a really good book. I loved the storyline of past and present as I had to know who was behind what and why. I thought I had a handle on the why, but the author’s continual plot twists had me quickly changing my mind and I was a bit surprised when the killer’s identity was revealed because that, I didn’t see coming. I liked that each chapter began with a natural remedy tip and within the pages you also found aromatherapy treatments. This is an enjoyable read that boasts a wonderful supporting cast to Willow and Jackson, good dialogue and a feel-good atmosphere. I look forward to the next book in this pleasantly appealing series. Suddenly, vandalism turns to murder—and the Kruegers’ dream descends into a nightmare. 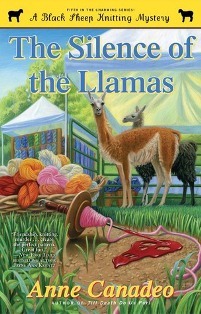 The Black Sheep knitters must pull the threads together and uncover this crafty menace . . . before more lives—and more llamas—are lost. The Black Sheep Knitters learn that their friend, Ellie and her husband’s farm have been plagued with vandalism and when their neighbor is later found dead on their land, the husband becomes the prime suspects and the knitters set out to find the real killer. This is my first time reading this series and I like it. The author did a good job in presenting a mystery that kept my attention from beginning to end with a couple of surprises that I did not see coming. 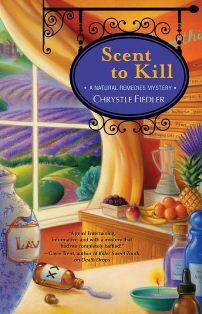 I mostly enjoyed the camaraderie between the knitters and how they gathered the clues necessary to apprehend a killer. This is a good mystery that boasts a great cast, good conversation and a sense of community. I look forward to reading the next book in this wonderfully crafted series. Bonus knitting projects and recipes are included. FTC Full Disclosure - The author sent me this book. I just want to read all those books! Thanks for the recommendations Dru. You make me want to get all of them. Thanks, DruAnn. Another great list, Dru Ann! Fun list! More to read! The Silence of the Llamas title totally cracks me up. New books and authors to check out! Thank you, Dru Ann!